On the most recent episode of Community Signal, I chatted with Sherrie Rohde about self-care for community professionals. 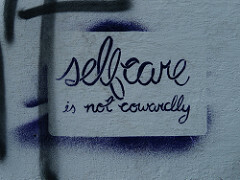 Self-care is exactly what it sounds like: making time to take care of yourself. In our line of work, we are sometimes told that community is a 24/7 gig. That because the internet is always on, so must we be. I know this sounds rude, but ignore anyone who says this. That belief leads to burnout, and it drives people out of our industry (or worse). Here are my simple rules for self-care. Community management is only a 24/7 operation if you have the staff and resources (money) to make it so. If you are one person, a community department of one, community isn’t 24/7. End of story. A human doesn’t scale that way. Volunteers can help, but you can’t schedule them, not without running afoul of U.S. labor laws, anyway. One community professional plus a team of volunteers is not 24/7 community management. If you work for a large company that can hire a team around the world and/or outsource key tasks during off-peak hours, then community can be 24/7. But for most of us, it isn’t. Being away from the communities I manage (and being away from the internet) helps me to keep everything in context. It allows me to reset myself mentally and refocus on what I want to accomplish next. It’s important. This means taking vacations and leaving for extended periods of time at different points of the year, but it’s also a daily thing. I divide my life up into five important things: family, friends, health, fun and work. Family: spending time with family. Friends: maintaining my relationships with my friends. Health: doing things that make me physically healthier, namely exercise and getting outside. Fun: non-work activities that I enjoy. If I’m spending time in any of these 5 categories, I try hard to view it as being productive – even if it’s not work. I don’t always succeed, but I try. The more balance I find between those 5 things, the happier I am – and the better community professional I can become. Our community guidelines are important. But no one dies because they are violated. We may be a respectful community that doesn’t use strong profanity, but if someone gets angry and drops an F word, there’s no fallout from that, whether it’s removed in 3 minutes or 3 days. 3 minutes is better, yes, but life goes on. This depends on what your community is about. If you are running a social app for minors or a community for people with mental health issues, those are much more sensitive and might require 24/7 community management. But that doesn’t describe the spaces that most of us are responsible for. Whenever a member has an expectation that I feel is not reasonable, with regard to the management of the community, I correct that expectation. For our purposes, this is anything related to the timeliness with which issues are handled, by me or my staff. While we read the vast majority of posts, sometimes we’ll miss something or, at least, won’t see it as quickly as the community as a whole. That’s why member reports are important. They allow us to see things more quickly. Rather than seeing a piece of spam and waiting hours to see if it has been taken care of, please report it when you see it. Once reported, please forget about it. Don’t let it consume too much of your time. A violation of our guidelines like this is unfortunate, but not a big issue. We’ll take care of it as soon as we see the post and/or your report. I find that, for the most part, members are receptive to this conversation. Long term, it’s far better to adjust their expectations to a more reasonable standard, than to try to keep up with expectations where you are doomed to fall short. While (pretty much) everything can wait, it’s important to know what a true emergency is – and to communicate that to your staff, volunteers or not. Spam, profanity, disrespectful comments, a random, racist troll; none of these are real emergencies. A suicide threat is a real emergency and, in the event of that happening, my volunteer staff members have my cell phone and they know to contact me immediately. Thankfully, this has happened maybe twice in my 15 years. But one time was when I was on a family vacation, and I communicated with one of my moderators (who also happens to work in law enforcement), to ensure that we handled it appropriately and delicately. The staff on my communities – 100% volunteer at this point – know when I will be away for any extended period. They know how to reach me, and I’m usually accessible via email or, at least, cell phone. I have a very veteran, experienced team on my largest community, and it’s one of the reasons that I can leave and feel totally confident that everything will be alright. It’s worth noting that I encourage my volunteer staff to practice good self-care, as well, at least as far as their role within the community is concerned. I have a pretty simple policy as far as being away: just let me know. If you need time away, that’s good enough for me. Of course, if it’s months or you simply disappear, then it might be better for you to leave the staff, at least for the time being, but otherwise, it’s only a matter of notification. This might be a sobering realization for some, but it’s something I accepted and embraced long ago: the community will be alright without me. If the community needs you to survive, don’t take pride in that. If the community can thrive without you, that is truly something to be proud of. This is why we put the work in, up front, to set the foundation for a strong community. When you do that, you attract the people who exemplify and reinforce the values that are now important to the community as a whole. We don’t do this so that they’ll always need us. We do this so they won’t. These are just my rules. They help me. But you have to find what works for you. Please make the time to take care of yourself.